After a week of strong winds today was a bit calmer. We used the opportunity to resume instruction to our paragliding students and went to Nummela airfield. 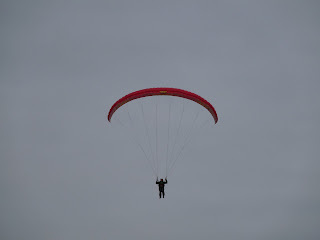 Although the sky was completely covered lift was abound and even the rookies had extended flights. Sakari, an experienced pilot, came by and had a nice half hour flight. The grey weather provided a good test environment for my new camera, a Panasonic DMC-FZ28. After a lot of research on the internet I concluded that it should be about the right camera for me: a lot of zoom power but still just about small enough to take along. Today I didn't take it on any flight, but used it to make some pictures and video snippets of our students. When students launch and land I have my hands full with radios for instruction and air traffic, so only took pictures from quite a distance using the maximum 18x zoom. The picture above shows Antti landing, taken from an approx. 150 m distance (unprocessed). So far I'm quite happy with the results and very happy with the "usability", I could easily handle the camera with my gloves on. Obviously I have to learn and practice with it quite a bit more, but the "automatic everything" settings indeed seem to work very well.